Weekly Indicators has been published at XE.com. Click on the link and you'll go directly to the article. Because the federal government is no longer reporting economic data during the shutdown, these indicators are especially important. And let's just say, "stuff" is happening. Claims for U.S. jobless benefits jumped last week to the highest level in six months, providing the first statistical warning that the damage from the partial federal shutdown is starting to ripple through the economy. While half the increase came from California as the state worked through a backlog following a switch in computer systems, another 15,000 reflected the furlough of non-federal workers from employers losing government business, a Labor Department spokesman said as the data was released to the press. Applications (INJCJC) for unemployment insurance benefits surged by 66,000 in the week ended Oct. 5 to 374,000, the most since late March, figures from the Labor Department showed today in Washington. What I find truly amazing about this whole process is that people don't think there will be a negative cost to Washington's Stupidity. I still find that utterly baffling. Beginning next week, thousands of home buyers will be unable to get approvals for their mortgages because of the government shutdown, potentially undercutting the nation’s resurgent housing market. Without paperwork from the Internal Revenue Service, the Social Security Administration and in many cases the Federal Housing Administration, banks and other mortgage lenders will be less willing to make loans, if they can make them at all. For instance, lenders rely on the IRS to confirm borrowers’ income and on Social Security to confirm their identity. Every day that government offices remain shuttered will delay an ever-larger fraction of mortgage closings, industry leaders say, jeopardizing mortgage and interest-rate approvals and spooking sellers. About 15,000 new home mortgages and 18,000 refinancings on average are completed across the country each day. Is the Oil choke collar beginning to give way? New post up at XE.com at the link. NDD talks about the oil choke collar and I explain the rupees recent drop. Regardless of your politics, you should care very much not just whether or not we actually fail to increase the debt ceiling, but that we are having the debate at all. Because simply having this debate is probably going to cost the US $billions, for years to come. Here's why. Suppose you are a bond investor. You invest in sovereign bonds of country X. Country X has always paid its debts, so its bonds do not carry a risk premium. They are viewed as the equivalent as carrying around cash - but cash that pays interest. Country X does have a quirk in its laws. Every now and then, on an irregular schedule, its legislature has to vote on whether or not to continue to pay it debts in timely fashion and in full, or to be a deadbeat. The question that the legislature votes on is, "Should we welch on some of our already existing debts? (a) Yes, (b) No." For 100 years the legislature has always voted "no." Most often, the vote was pro forma. Sometimes, one or another faction made a show of disapproving of the debt level at which the country was operating, and so delayed the vote (but not the payments) for a few days, but after the brief dog and pony show, the vote was always the same: "no." Twenty years ago, for the first time, there was a real donnybrook about what should be in country X's budget. The government actually closed down for about three weeks. And for the first time, there was talk of voting "yes" unless changes were made in the budget of country X. As an investor in country X's bonds, you no doubt shrugged off this episode. It was a particularly nasty partisan show, but nobody seriously believed that country X was about to welch on some of the payments owed to you. It was a classic "one-off," you thought, and that was that. But then, two years ago, one political faction in country X seriously suggested that country X should welch on some of its debts unless fiscal policies it wanted were implemented. A second big political faction in country X negotiated with them about that issue. For a brief while, it looked possible that the legislature might actually vote "yes" on that quirky question about welching on some debts. Ultimately, the political faction which suggested welching on some debts got some of what it wanted. Now, only two years later, there is a repeat of the same fight, except now, it is even more serious. One political faction has indicated unequivocally that voting "yes" on that quirky question is a valid way of achieving fiscal leverage. This view appears strategically correct in the political sense, because last time the other political faction engaged in negotiations to alleviate the threat. Some members of the legislature have written newspaper or magazine articles, or given video interviews, indicating that welching on some debts to some creditors is really OK. Others have shown that they really have no clue about how your market operates, because they believe that if they are paying interest, even though they are missing principal payments, country X really isn't welching on its debts. Let's assume that country X's legislature ultimately votes "no" on that quirky law again. Do you, as a sovereign bond investor, continue to treat country X's bonds as cash, worthy of no risk premium? The answer to that, I believe, is no, you don't. Threats to welch on country X's debt are no longer for show, and the serious threat to do so is no longer a one-off which will not repeat. In fact, it's quite clear that a dynamic has been put in place whereby a faction in country X can and will seriously consider voting "yes" on that quirky question unless it gets its way on unrelated issues. The legislature is increasing the frequency of when the vote on the quirkly law must happen, and the partisan battles over the quirky question are becoming more intense, more protracted, and the brinksmanship is increasing each time. Now you have even seen a significant share of the legislature declare that it is OK to stiff some of country X's creditors. Maybe you. In short, the battles over welching on country X's debt are becoming more frequent and each time country X gets closer to actually welching. It appears that it is only a matter of time - and maybe not long at all - until country X actually welches on some payments of some debt. So, you now want a risk premium, even though country X still has never missed even a single payment of interest or principal. Turning now to the actual US situation, if the debt ceiling impasse is only put off a short time, like a few months, the dynamic of moving closer and closer to actual default is accelerating. It seems pretty clear that the rational investor will begin to insist that US bonds actually be assessed a risk premium. Even though the debt ceiling has never caused an actual default. That in itself ought to be a pretty sobering thought. Yesterday, the market sold off on sharp volume, falling through short-term support. 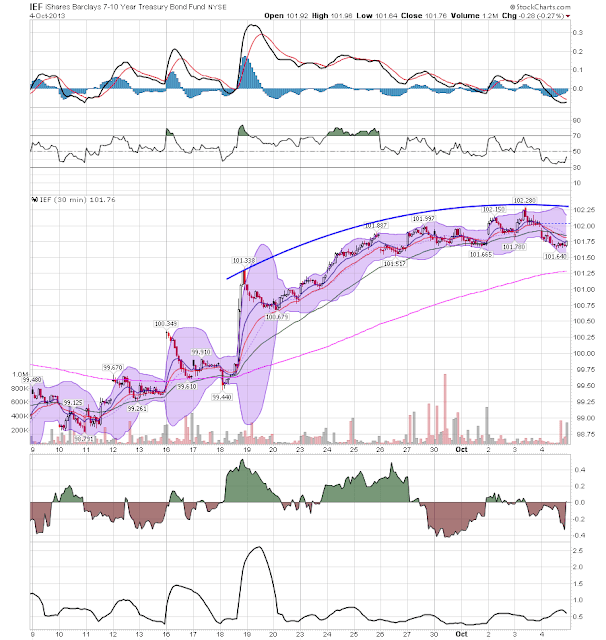 Added together with the weakening technical position, we could be in for a bumpy ride. Investors such as Fidelity and other money funds are already voting with their feet. Yields for bills that mature in October and November have risen above 30 basis points – a level not seen since late 2008, when the Federal Reserve adopted a zero interest rate policy during the depths of the financial crisis. CDS on US government debt has doubled in the past month and trading volumes have jumped as a growing number of investors have bought the instruments, seeking protection against a potential default or making bets on subtle movements in the derivatives. If someone is telling you there won't be an impact, they're wrong as one already exists. This is available over at XE.com. The chart above is from Dr. Eds blog and shows that total federal spending has been flat for the last few years while federal receipts are increasing. This means the deficit is also decreasing. If We Sell-Off, Is Washington to Blame? Below is a weekly chart of the SPDR S&P 500 ETF. As you see, over the past few years, the market has been on a tear with only really one correction along the way. 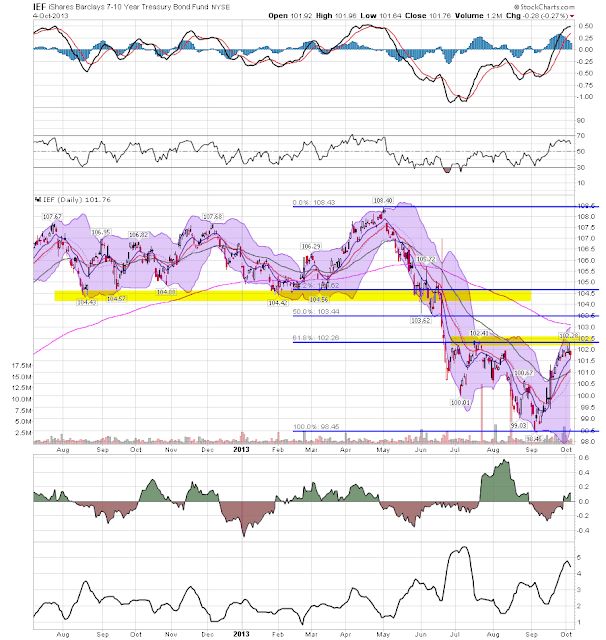 There have been a few pullbacks and each pullback has been a buying opportunity. This year, the market has had another nice run, but over the past few months, each new high has only been marginally higher. While this is not utterly bearish, this is also not the most bullish sign. 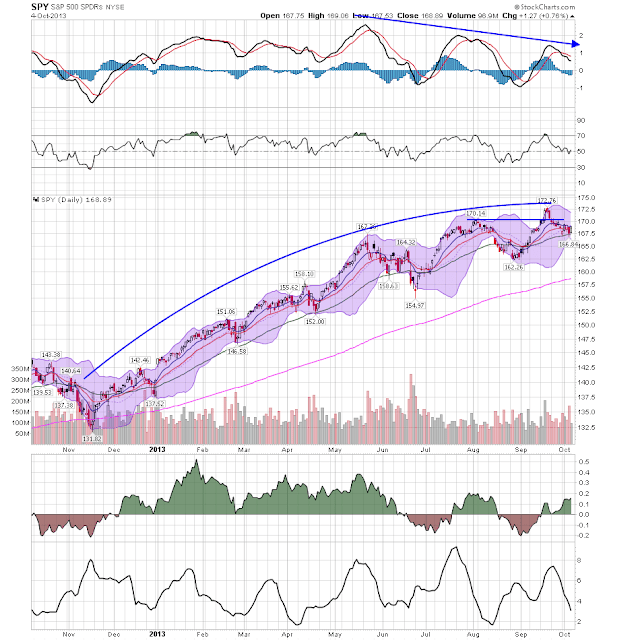 As you see, there has been a negative divergence in the RSI (the pink line on the bottom). 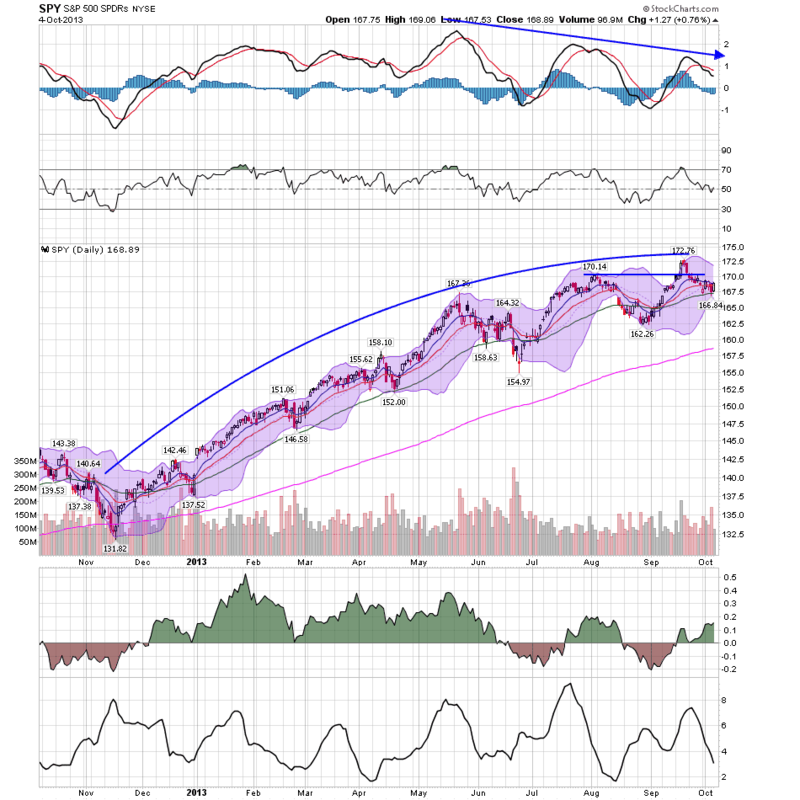 Each new high in the market has registered a lower RSI reading. But what I’m watching the most is the trendline that has been established and held a few times over the past year. If this breaks, we could see some technical selling, triggering a 5-10% market sell-off down to around the 50 week moving average. The “QE3 top” might be formed. 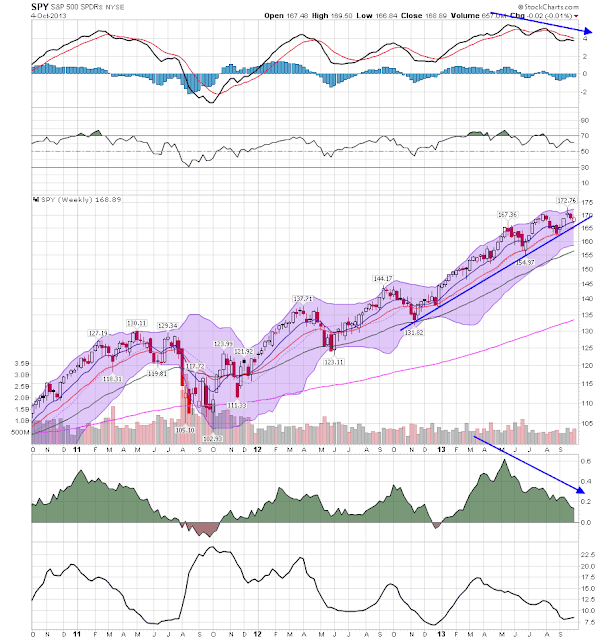 He's noticed a declining RSI; yesterday I highlighted the weakening MACD and CMF readings as well. I also noted that on the daily chart, we're seeing a move from an upward move to sideways consolidation. I think the proper way to think about it is the Washington situation may be the eventual trigger that causes the sell-off. Like a runaway train, the US is hurtling towards a debt default, only about 10 days away, with no signs that the pepretators - the extremist anti-government gerrymandered GOP in the House of Representatives - is going to surrender to responisibility before then. At least one reason why the impasse is dragging on in on is that we've only had a "faux" government shutdown, not a real one. True, the national parks have been shut down, and over half a million federal workers have been sent home, but the average citizen hasn't been inconvenienced in the slightest by this. And that only feeds into the narrative that the federal government really doesn't do anything. The idea of keeping "essential" government workers on the job dates from a more genteel era, when it was understood that the two political parties were just posturing, and neither one was infested with anarchists intent on repealing everything that happened after 1861. My old german grandmother used to have a saying which translates into english as "Those who cannot see must feel." Simply put, it is time for average Americans to *feel* what they need the federal government for. So while we're back to things like Atrios suggesting that a $1 trillion platinum coin be minted, and others are proposing that Obama simply ignore the debt ceiling law, I have a more honest proposal: instead of ignoring a law, actually enforce the lack of funds to pay for federal services. No National Weather Service - so no weather forecasts. No customs bureau - i.e., the borders are closed. No cargo inspections - i.e., the ports are closed. Am I really proposing this? Absolutely. Am I being heartless? Hell no, far from it. I predict that within 24 hours of the above measures taking effect - like they actually should have taken effect on October 1 - the government shutdown will end. Even more importantly, the move to actually default on debts Congress has already voted for should stop in its tracks. And that's because people will finally understand that their tax dollars actually support all of the basic things they take for granted. Too many people simply don't see. It's time for them to learn by feeling. Grains (JJG, top chart, corn, wheat and soy) and softs (JJS, bottom chart, sugar, and coffee) are both in a long-term downward trend. There is no upside momentum either. But in CPI terms, one of the more volatile elements of overall inflation is under control. The analysis of last week's US economic events will be available at XE.com later today. Let's place the SPYs overall actions into a larger, weekly context. 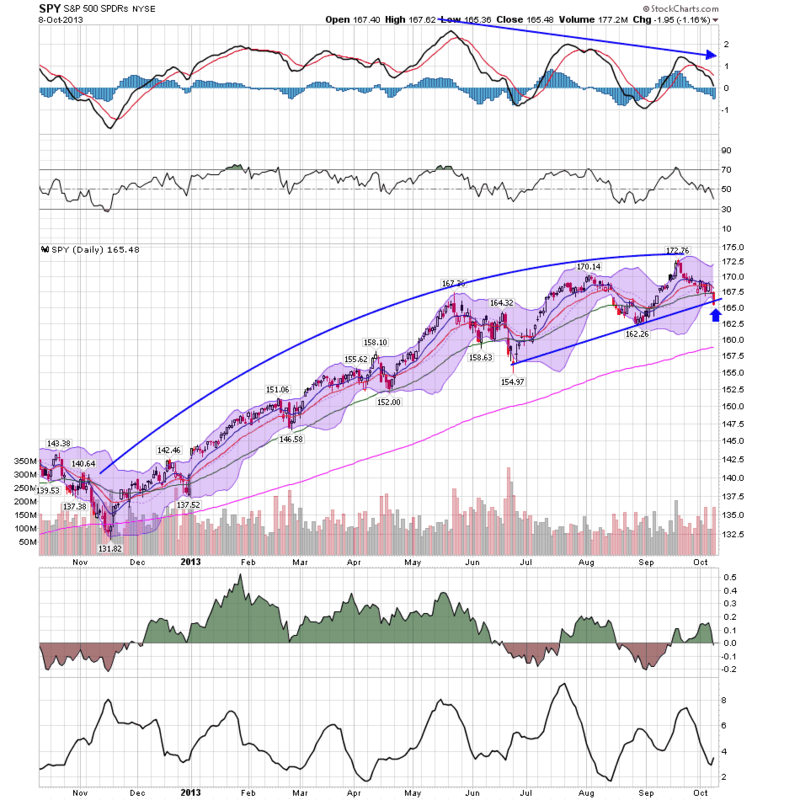 While the market has been rallying for about a year, momentum has been dropping for the last four months, as has the volume flow into the market. 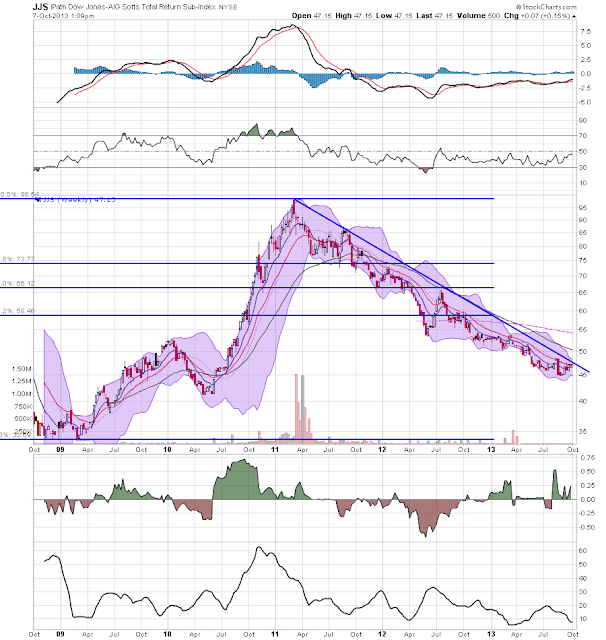 On the larger scale, further upside moves are limited according to this chart. 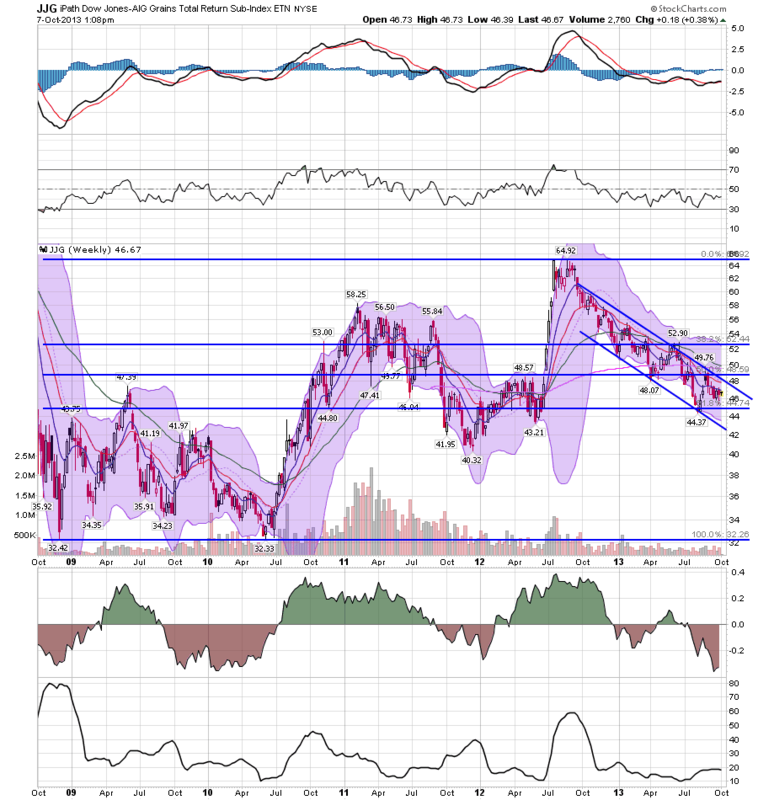 The daily chart is also getting weaker. First, the overall arc of the price movements is leveling off, becoming more horizontal. And while the overall trend is still higher (a rising 200 day EMA) the shorter EMAs (10, 20 and 50 day EMAs) are also leveling off. 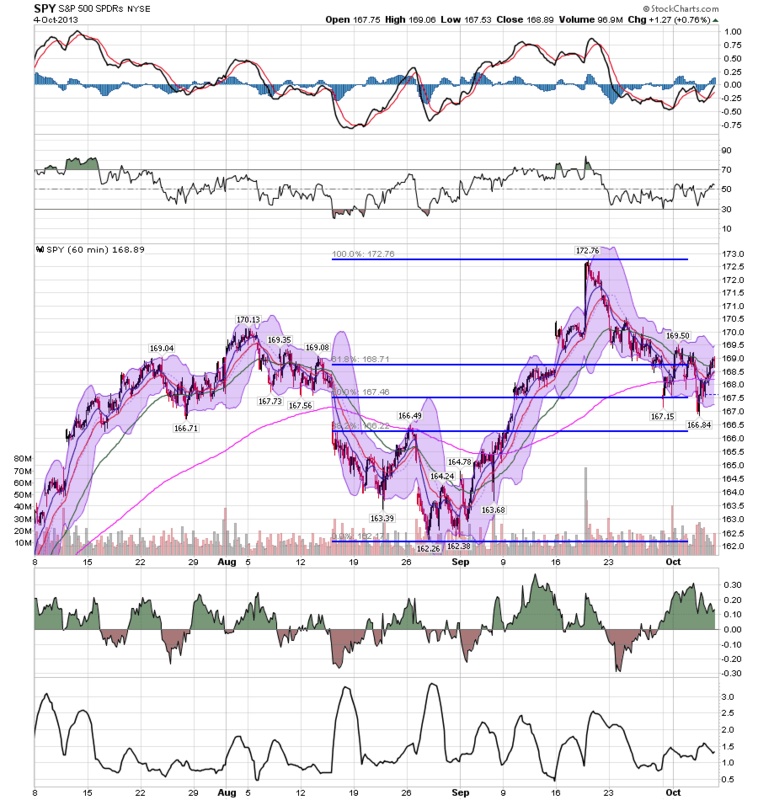 Momentum is also dropping and volume flow is weak. On the 60 day chart, we see that prices have adapted to the government shutdown well. 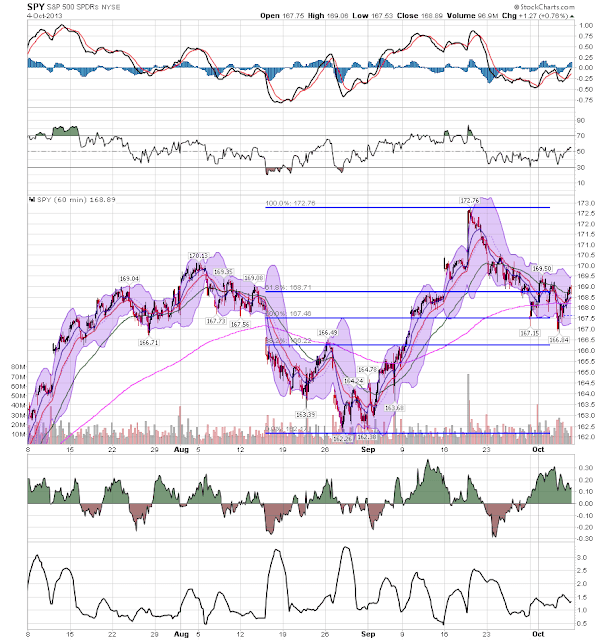 Prices are trading withing the Fibonacci retracement levels of the early September, mid-Spetmber rally. From a technical standpoint, the most important element of the chart is that prices didn't crash last week. Turning to the treasury market, the daily chart of the IEF shows that prices have rebouned, hitting resistance that price points from the early summer sell-off that also correspond to Fibonacci retracement levels from the May-September sell-off. While momentum is rising, it's also hitting levels from earlier this year. Also remember that the market is waiting for the Fed to start tapering, so don't expect a strong fundamental bid to take place. Finally, volume flow is weak. On the 30 minute chart, notice the strong move on the 19th when the Fed announced it wouldn't start tapering just yet. However, since then prices have been moving in a slow arc, further confirming the fact that the bid just isn't that strong in the market right now.